When the green flag drops for the 2016 Indianapolis 500, it will conclude the 100th time that the field will be brought to the starting line by a pace car. The first 500-mile race held at the Indianapolis Motor Speedway was paced by a Stoddard-Dayton roadster. The forgotten Dayton, Ohio auto company that supplied vehicles that served pace car duties for three of the first four Indy 500 races, Stoddard-Dayton was chosen since the track founder Carl G. Fisher happened to own a dealership. He realized the marketing opportunity provided by leading the courageous group of competitors was realized. While it has been 2003 since a vehicle other than a Chevrolet Camaro and Chevrolet Corvette was a pace car, there is a colorful history of vehicles serving the race. Concept cars, heavily-modified production cars and even truck-like Indy 500 pace cars have been used at the race. Generally, the vehicles receiving the most attention to aerodynamic tuning in modern Indy 500 races are the cars entered in the race. However, the infancy of wind tunnel-based science in the 1930s and early 1940s consisting of streamlining gave Chrysler designers an edge with their 1941 Indianapolis 500 pace car. The 1941 Chrysler Newport is the most ostentatious example of customized Indianapolis 500 race cars. The Newport was a concept displaying Chrysler’s effort in perfecting the streamlined shape. The slickly-shaped vehicle was shaped with aluminum (at the time a highly exotic metal). The streamlined design incorporated hidden headlights and rear fender skirts. Besides the aerodynamic shape, the Newport stood out thanks to its dual-cowl appearance resulting in two separate passenger compartments. Though aerodynamically styled, the 1941 Chrysler Newport was a heavy vehicle. The car also lacked side windows limiting its practicality when weather turned less than hospitable. A 143-horsepower straight-eight powerplant was dropped into the Newport’s engine bay. Since the Newport would never exist as a production car, the 1941 Indianapolis 500 was one case when a tradition was broken where the race-winning driver would receive a similar vehicle to the pace car. 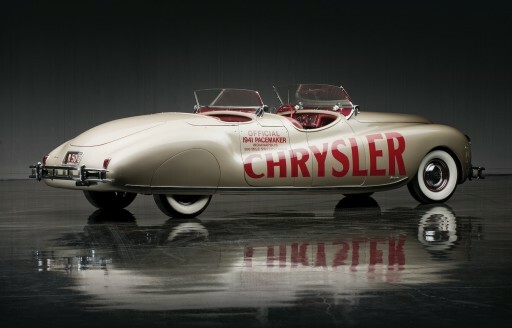 As a result of the United States entrance into the second world war, the Chrysler Newport concept car would be the final pace vehicle to circulate the 2.5-mile track until 1946. 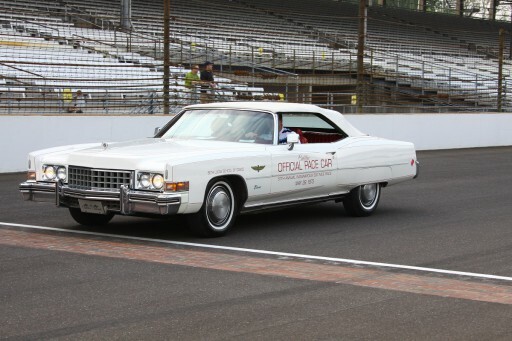 Starting with the Cadillac Eldorado used for the 1973 Indianapolis 500, an era began where pace cars received a level of performance enhancement near similar to the vehicles competing. Due to early emission control equipment mandated for road cars, engines previously entrusted to generate over 400 horsepower were choked in power production towards embarrassingly low amounts. When the 1973 Cadillac Eldorado was chosen as a pace car, the dilemma was in moving the heavy convertible with the muster of a 500 cubic-inch engine generating only 235 horsepower. To give the Cadillac enough muscle to lead the field around on the pace laps, engineers chose to remove what held up the Eldorado convertible. Emission controls and air conditioning was strapped from the car while the engine was heavily upgraded. With all the changes, the 1973 Cadillac Eldorado Indy 500 pace car’s momentum was said to be estimated at around over 500 horsepower. The white convertible was complemented with a red interior and a tasteful use of pin-striping. Since General Motors had forbidden Pontiac from selling a vehicle to compete with the Corvette, the former American brand that touted sportiness as a calling card had to find alternative ways to express itself in a sports car niche. The Pontiac Fiero was not a world-beating performance car but captured the sports car spirit in a unique manner. A two-seat, mid-engined compact car was produced from 1984 to 1988. Assigned the duty as 1984 Indianapolis 500, the Fiero proved an eccentric choice. The small sports car made an impact on pace car history. One notable distinguishing quality was that the Pontiac Fiero became the first four-cylinder powered Indy 500 pace car since a Stutz roadster used in 1912. Instead of a 92-horsepower 2.5-liter powerplant found in the 1984 production vehicle, the Fiero Pace Car’s Iron Duke engine was bored out to 2.7 liters and included a slew of high-performance engine accessories. The modified Indy 500 pace car’s output was rated at 232 horsepower and was cooled by a unique roof scoop. A unique front nose, large rear spoiler and chrome wheels also defined the composite bodied sports car. 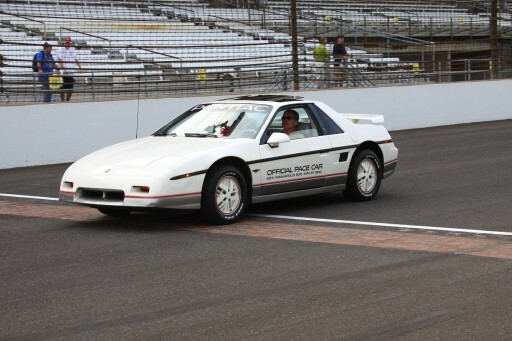 To this day, the Pontiac Fiero is the only rear mid-engined vehicle to pace the Indy 500. Through the 1980 and the early 1990s, General Motors made a habit of creating customized convertible pace cars for the Indy 500. Started in 1981 with a Buick Regal pace car featuring a largely hacked-up roof, non-production convertible versions of the Oldsmobile Calais and Chevrolet Beretta were also used in 1985 and 1990 respectively. Between the Calais and Beretta, the 1988 Indianapolis 500 featured an open-top Oldsmobile Cutlass Supreme. Converting the two-door Cutlass Supreme coupe to a convertible was handled by a coachbuilder in Michigan called Cars and Concepts. In addition to the Indy 500 pace car, 50 convertible replicas were produced by the company. If the top not already been removed, the 1988 Oldsmobile Cutlass Supreme pace car included performance that could figuratively blow its top. A turbocharged and intercooled version of the 2.3-liter Quad Four engine was dropped into the car producing up to 250 horsepower. 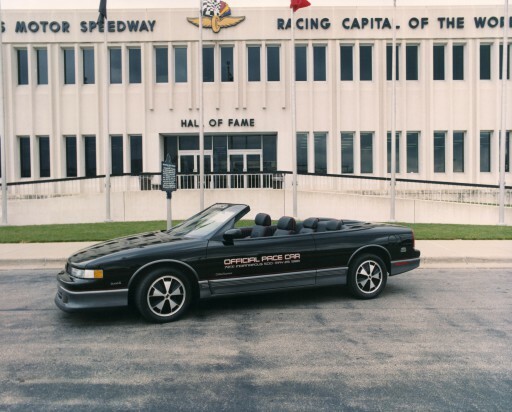 The black and silver-gray colored Cutlass Supreme convertible pace car was driven by a man who travelled faster than any Indy 500 pilot. Chuck Yeager, the first person to fly an aircraft faster than the speed of sound, drove the Oldsmobile. The 1988 race was Yeager’s second time as a pace car driver having driven a Chevrolet Corvette two years earlier. Similar to a modern jet fighter aircraft, the Oldsmobile Cutlass Supreme pace car included a head-up display system. Unlike the Chevrolet Beretta and Oldsmobile Calais, the Cutlass Supreme would appear as a convertible production car in 1990. 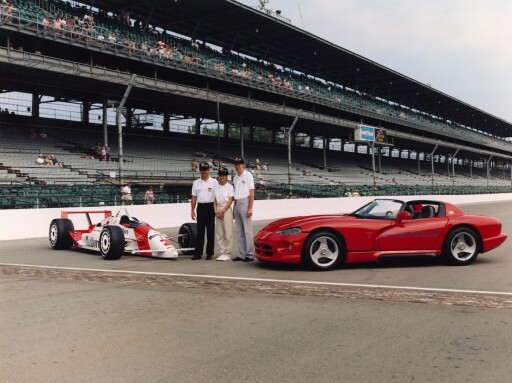 The Dodge Viper’s presence at the track came as a reaction to a patriotic call coming after negative reaction from the originally planned pace car for the 1991 Indianapolis 500. Ahead of the classic 500-mile Memorial Day race, Dodge was ready to show-off their sleek sports car called the Stealth as the pace vehicle ahead of the 33-car group of competitors. Wearing badging from Chrysler’s American brand, the Dodge Stealth was actually produced in Japan alongside the Mitsubishi 3000 GT. Since the notion that Dodge Stealth was seen as a redressed Japanese vehicle, controversy led Dodge into selecting another vehicle that generated stunning fanfare. Chosen hastily after press kits of the Dodge Stealth had already been sent out, the decision was made to give the V-10 powered Dodge Viper pace car duties for 1991. The red American supercar roadster pacing the 1991 Indianapolis 500 created a big stir ahead and during the event. At the time, the Dodge Viper RT-10 existed only as a prototype with production of the car not slated until 1992. The 8.0-liter V-10 engine was more than capable thanks to 400 horsepower and its wide rear tires insured the power hit the bricks for maximum thrust. Selected as the driver of the 1991 Indy 500 pace car was Carroll Shelby who served as a consultant for the Dodge Viper’s creation. For many reasons, the 2001 Indianapolis 500 pace car was a stunning selection. For the first time in the history of the Indianapolis Motor Speedway’s most prestigious race, the vehicle was not even a car. Reflecting the reality of the American roads, an all-new 2002 Oldsmobile Bravada sport utility vehicle (the last new vehicle developed for the division) was selected. The only other time a truck-like vehicle has been used for pace car duties occurred in 2003 when a Chevrolet SSR was picked. The Garnet Red Metallic 2002 Oldsmobile Bravada used for the 2001 race was largely a stock model powered by a 270-horsepower 4.2-liter Vortec six-cylinder engine. As a final distinction for the 2001 Indy 500 pace car, Elaine Irwin (at the time wife to John Mellencamp) was the first female to drive the lead vehicle. The 2001 Indianapolis 500 duties were seen as a swan song for the make for Oldsmobile who held the ceremonial role nine times prior. Oldsmobile production ended in 2004 but the announcement of the brand’s shuttering had already came as the Bravada served as a pace vehicle for the brand’s tenth and final occasion. I own a 1954 Rolls-Royce SJF 240 Rolls. I was to be a pace car for one of the years around 1980 to 1988 Is there any record of this. ? I was married to Dale Powers , we both owned Powers Automotive (Proper Motor Cars). Members of the Rolls-Royce owners Club at the time.